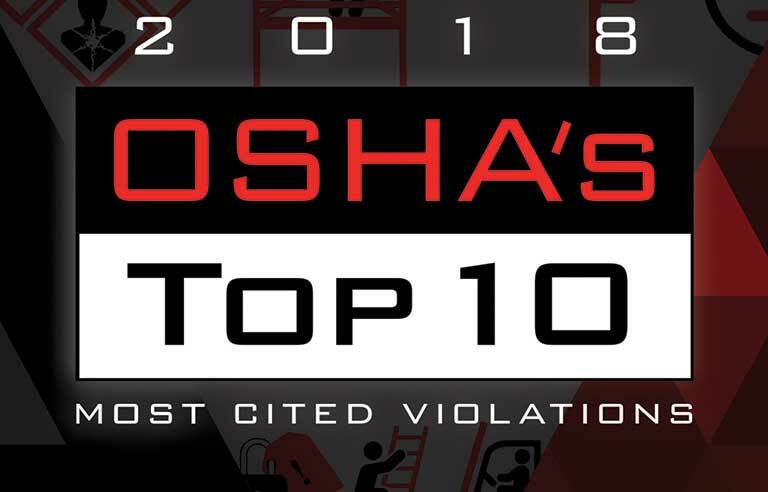 The Occupational Safety and Health Administration (OSHA) has announced the 10 most frequently cited workplace safety violations for fiscal year 2018. While there was only one new edition and most of the rankings were unchanged from 2017, all types of violations should give you cause to stop and think about how well you’ve done with safety in those areas. A new entry to the top 10, eye and face protection was a rapid riser for 2018 (going from unranked to top 10 with 1,528 violations). Workers exposed to flying particles or chemical gases/vapors bear the brunt of this category. In a manufacturing facility, this may be more of an issue than in general warehousing, but there are still situations where warehouse employees should have face protection, and frequently they require protective goggles near running machinery and tools. There were 1,969 total violations in 2018. 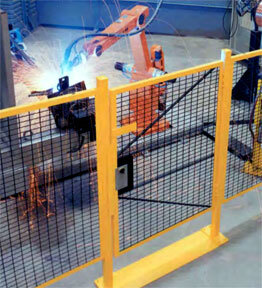 Machine guarding is meant to protect workers from point-of-operation hazards and dangers caused by nip points, rotating parts, flying chips and sparks. Point-of-operation hazards account for most violations. This is a frequent concern for employees who operate near palletizing robots or even conveyors in some instances. For warehouses, conveyor guard rails are also part of this issue, as they help prevent fingers and hands from exposure to gears or belts. There were 1,978 fall protection training violations in 2018. This category debuted on the top 10 last year and figures to stay. It is critical for warehousing to reduce falls due to slips and elevated heights and other potential hazards. Equipment included are fork trucks, tractors, platform lift trucks, motorized hand trucks and more. Forklift drivers must be trained, certified and reevaluated every three years. Improper fork lift use and training account for many violations. There were 2,281 violations in 2018 compared to 2,349 in 2017. Forklifts and other industrial traffic can be particularly dangerous in warehouses or sites that utilize them. This has been a focus for many of our clients. 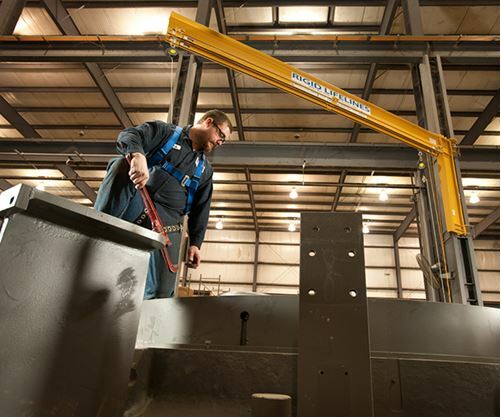 Aside from training, there are options like automated gate systems, safety/warning sensors, simple running lights, and guardrails to help restrict interaction between forklifts and people. Check our blog for extensive information on methods and technologies for improving forklift/pedestrian safety. Improper use of ladders resulted in 2,780 citations in 2018 compared to 2,567 in 2017. To keep your workers safer, insist on safety training and then enforce the rules. OSHA standards address load capacity, step surfaces, clearances, ladder cages, and even step stools. Ladders are a constant companion to fall-related issues and violations. In general, you should have a defined ladder safety program and install other means to reach areas at height when possible. Crossovers, platforms and other solutions should be deployed whenever possible. In a warehouse, so much of the maintenance occurs at a height due to tall ceilings, picking from racks, and other means of elevating workers. While ladders are safe for those functions if correctly specified, it’s always best to find ways to minimize these types of risks. Ladders are a pretty universal fall protection issue. People tend to use them incorrectly, quickly and unsafely. See Step Up for Ladder Safety for more information. Violations have dropped to 2,923, but this category is a clear danger. Lockout/Tagout procedures are meant to safeguard employees when machinery starts up unexpectedly or when hazardous energy is released during maintenance activities. Failing to train workers or conduct periodic inspections account for many violations. Lockout/Tagout is really important for warehouse operations where maintenance is done on conveyors, forklifts and other common equipment. Violations fell to 3,112 for 2018. These include failing to have a written respiratory protection program and failing to conduct required medical examinations for workers who use respirators. There were fewer scaffolding violations in the construction industry in 2018 (3,319) than in 2017(3,697). Safety violations include issues with scaffold construction, employee access to scaffolding surfaces and lack of guardrails. There were 4,537 citations in 2018, which is down from 4,652 in 2017. Employers that use hazardous chemicals must have a written hazard communication program. They are also required to label all containers and provide safety data sheets and training to employees. There were 7,216 fall protection violations in the construction industry, which is actually an increase from the 2017’s 6,887! These violations include failing to guard edges and open sides to prevent workers from falling. Guard rail, handrail, mezzanine gates, caged ladders, hatch and skylight protectors can help prevent falls in your facility. Shipping & receiving docks are a huge concern. They help generate fall injuries due to frequently open ledges and edges. A variety of dock edge protection gates are available to help reduce these risks. See OSHA Requirements for Better Dock Fall Protection for extensive analysis. Mezzanines, pick modules and other edges are another area where falls can happen in industrial facilities. These high-ceiling operations tend to build elevated work platforms where there is a need to expose an edge to load, process or unload. These citations offer a clear warning of what is catching OSHA’s eye when inspecting a site, so make sure your Safety Department reviews the regulations and evaluates how well you meet the standards.